As if organising the BRND WGN & University Ring Road Races wasn’t enough, we wanted to live up to our promise of stepping things up. One of the main scopes of this event is to raise money for Hospice Malta, in fact half the proceeds are always donated to the cause. But then we met the BRND WGN crew and that’s where we had our ‘Eureka’ moment. We were able to make use of their Wagoneer in chief – Murphy (the mysterious man in the pink morph suit) and set him the challenge of running for a cause. 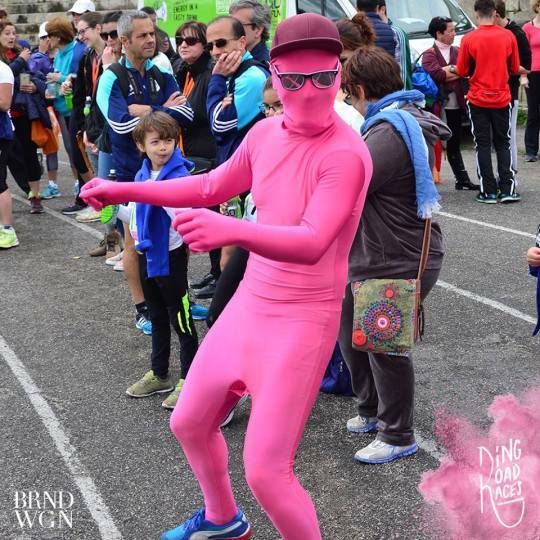 BECAUSE WHAT STANDS OUT MORE THAN A MAN DRESSED FROM HEAD TO TOE IN PINK, RUNNING IN A CROWD! We set up an online campaign to encourage people to donate with the focus on MURPHY. As we had predicted, he built quite a reputation for himself participating in both the Malta Half Marathon as well as the BRND WGN & University Ring Road Races. Murphy was the talk of the town, everyone wanted to know who he was. His efforts didn’t go unnoticed and we are pleased to announce that a total of €1,061 was raised this year for Hospice Malta through the online campaign. We are extremely grateful to all those who donated. The actual amount which will be donated to Hospice Malta will of course be higher than this as it will also include half the proceeds from the races as well as the money collected on Sunday. The total amount to be donated will be announced shortly. With the races over for 2016, it’s time for Murphy to pack up his pink morph suit and take a break from running for the moment. But don’t despair, we’d like to think of it as more of an arrivederci, he will be back next year and boy are you in for some surprises as Murphy takes on his next challenge.